Full documentation on all features and properties! The HELP file is about 460KB offering you complete help on your design efforts. A complete printable manual can also be downloaded. 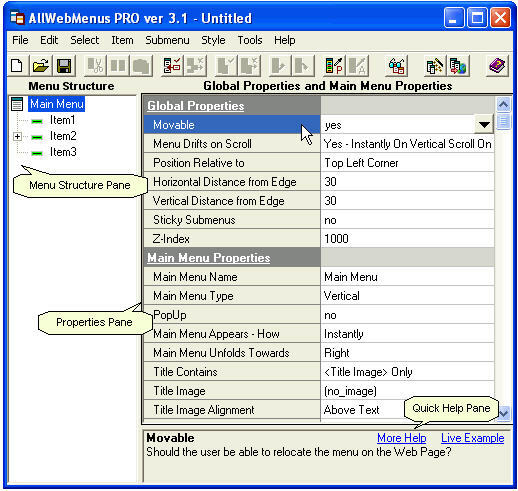 TUse AllWebMenus with all Authoring Tools without hassles. Advanced options for seamlessly support of:Dreamweaver Templates, Libraries and Includes;FrontPage Shared Borders and Includes; Netobjects Fusion Masterborders; and all other Authoring Tools! Create menus for framed web sites (cross-frame menus). Create any kind of menu fast by using pre-designed menu styles from the Style Gallery. Create, link and update a menu into your web pages in no time and without any code required. Use multiple menus in the same page. Free Sitemap generator based on the functional menu structure. Use two flexible ways to position your menus:using window coordinates;attaching the menu to any table cell inside the page. Use menus with Shared Borders, Templates and Libraries. Use the Pick Style and Apply Style functions to quickly transfer an item's appearance to other items.